October 2, 2017 – Today, our time machine follows professional baseball players, onto the battlefields of Europe in World War One a century ago. 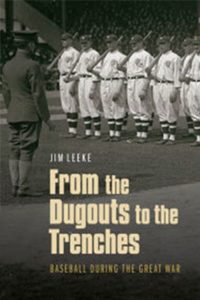 We hear the story about how the game, players, fans and the War Department clash in From the Dugouts to the Trenches: Baseball During the Great War , by author Jim Leeke. Jim is a contributor to the Society for American Baseball Research Baseball Biography Project, as well as the writer or editor of several books on U.S. and military history. We chatted a previously with Jim about his Civil War novel for young adults: Matty Boy, and talked about a single, special game along the lines of today’s topic in his book: Nine Innings for the King: The Day Wartime London Stopped for Baseball, July 4, 1918. Which makes Jim, our three-peating guest. Find Jim on at AABaseball.org or on Twitter @WW1Baseball.